The Sinn Fein movement in this country has up to the present happily been confined to more or less disconnected sets of individuals. It is, nevertheless, we fear, beginning here and there to assume an importance which is not yet justified by the numbers of its adherents or by their influence, It is, so far, mainly composed of young men of misguided views and imperfect knowledge of the effect of their conduct. It is a comprehensive designation that is found wide and accommodating enough to include in its ranks every form of crank and discontent. It is a kind of political cave of Adullam, the refuge of every sore head in the community, and of every impracticable dreamer and theorist. We do it the justice of assuming that it is an honest and, according to its lights, meant to be a patriotic movement, having for tis end and aim the real good of the country. It is possible that these beardless young men who have not got out of their political primers know a great deal better what suits Ireland and helps its interests in this war than do the tried and experienced men who direct the national movement. But the Sinn Féiners are going too far and too fast, and we ask them do they really consider what all they are doing and saying lead to? The time for playing this game as a mere schoolboy diversion has passed. Things are beginning to look too serious. The time has come for very plain speaking and clear thinking on this matter. There can be no more trifling or tomfoolery. Either the men are serious and mean what they say and have calculated the cost or they do not. The direct resuklt of these open-day defiant demonstrations of armed or semi-armed bodies of men not intended for the supreme work of defense, not recognised or organised for fighting the real enemy when, and where ge can best be met and fought, is to challenge the Government. Are our young friends prepared for the inevitable issue of their conflict with authority? They must recognise that for the purposes of home defence they are as a body absurdly useless and we believe that notion has gone home to them. No such imperfectly trained body as they are, with their equipment, experience, and their numbers, could for one moment seriously dream of standing up against any German force with its splendid coherency and discipline. Ten thousand Prussians could, so far as the Irish Volunteers are concerned – with impunity or dread of resisitance – march from one end of Ireland to the other. To oppose even such a small invading army would for them be folly and we do not believe the Sinn Féiners have at heart that intention. Therefore, as for the purposes of home defence they at present are useless, and not only useless but harmful, they have no reason for existence. The only effective way to fight the Germans is in the trenches with the Allied forces, and it is ridiculous to think of any other method. When, therefore, a lot of young men declare their willingness to fight, but refuse or refrain from fighting the only enemy in the only manner their action will be effective and useful, other considerations must occur to persons as to the honesty and sincerity of such declarations. If these declarations of manhood of Sinn Féinism continue to be defiantly made in our towns and cities the authorities will be constrained to prevent them by force, and mischief much result. It may even be thought that the methods of conscription may be found ncessary to deal with such a class of person, and thus as the result of the present Sinn Féin miovement compulsory military service may yet come to be applied to Ireland. It must not be forgotten that the Empire is now fighting for its very existence and that we in these countries are engaged in a life and death struggle, one in which every form of democratic freedom must go down in the dust of defeat or we must triumph. For a body of feather-headed young Irishmen led on by men probably who do or should know better, to throw the gauntlet down and defy the authoriities as these men are doing is for them a very dangerous game. They are undoubtedly guilty of sedition, and when deliberatley doen if they persisit in their illegal course they must be prepared to take the consequences. If they do they will gain more respect for thir manliness however misdirected than people are inclined to attribute to them. Some doubt their courage when the real pinch of peril comes, but we trust they will avoid the trial. They areplaying a very dangerous game, and one which cannot, in any well constitued society when it is engaged in its own protection, be allowed to go on. Those acts on the border line of lawlessness cannot go on with impunity, or authority will be abrogated and have to give place to anarchy. We sincerely trust that these misguided young men will not persisit in further provoking the long tried toleration of the authorities. They have gone far enough already, but there are signs that there is a limit to endurance and that it is reached. The country is at war and sedition cannot with impudent impunity be permitted to stalk the street. The Sinn Féiners’ military metghods and their demonstartions are a direct challenge and defiance of the authority of the Crown and the sooner these reckless enthusiasts in town or country come to realise the effect of their action the better for their own safety. These are no times for such tactics of temerity, treachery and treason. The political effect of the conduct of such men, as regards to the national movement, we are sure they cannot have paused to consider; or if they did aand that they are patriotic Irishmen they would not be guilty of acts so calculated to injure the fortunes of Home Rule. 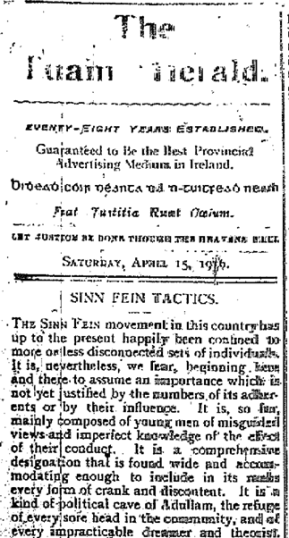 If really and genuinely Nationalist, as we would wish to think they are, however, misdirected in their present movements, the Sinn Féiners would not be doing what their political enemies will out here use against them and against the country that allowed such conduct to go on unnoticed, uncensured and unchecked. These foolhardy fanatics are consiously or unconsiously playing the Unionist game and doing more discredit, defeat and damage Home Rule than possibly can be conceived. They are detracting from the credit and the merit of the superb conduct of their brave countrymen who went out to fight for justice and liberty in France, Flanders and Turkey. They are acting as only the tools of autocrats and the blind instruments of German Militarism would act, and are strivng by their sympathy with German murderous methods and their inaction in resisting them to bolster up the worst form of tyranny that was ever sought to be imposed on man – the latest methods of German rule under which three nationalities groan and suffer. For young men who profess to be lovers of liberty to act in such a manner is incomprehensible. For persons who profess to be democrats and to have democratic ideals to side with a form of governmnet that is the negation of all democracy is incredible, assuming these men who so act know what are the effects of their actions and pause to consider the consequences of what they are doing. We, therefore, advise them in their own interest and for the sake of the national cause which we do them the justice of thinking they really wish to serve for our common country’s good, to abandon their present perilous, puerile and provocative conduct, and to conduct themselves as befits responsible citizens in a time of great national danger.